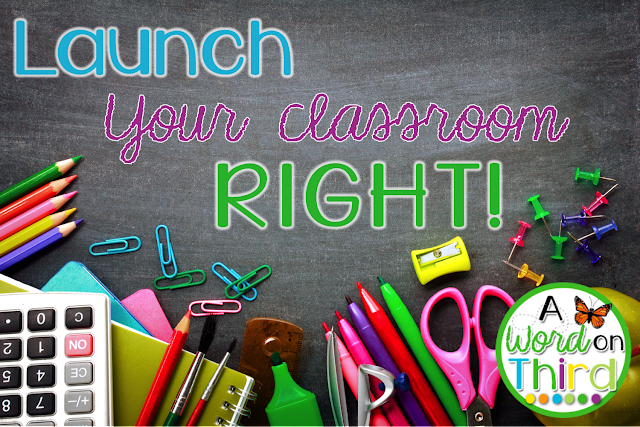 Launching your classroom the right way is so important! When you take the time to be intentional and teach explicitly, it saves you loads of time and headaches later on. Whether your new school year started a few weeks ago, or it's just about to start, make sure you check out any posts you missed in this series! Click each picture to be taken to the post covering that topic. In this post, I cover interactive modeling and guided discovery. I show you the steps involved in each and included some videos that Responsive Classroom uploaded onto their YouTube channel. (By the way... do you visit their YouTube channel? No? GO NOW! You'll thank me later.) I even have a little trick for all of you neat freaks out there! I think that this post is key in getting your kids to follow your rules. Involving your kids in rule generation gets kids to invest in making good choices, and so does connecting the rules to their hopes and dreams for the year. Even if you've already written rules for your classroom, it's not too late to refresh or restart with these ideas! I'm going to tell you a secret. Yes. Yes, time out really is helpful. BUT! It's also really detrimental to kids if you're not teaching it the right way. Time out is the same as taking a break when you need to calm down. Nothing more, nothing less. Let me show you how to use this tool to make your classroom a happier space. Don't bite off more than you can chew for the first few days or weeks of school. Launch your meetings calmly and in an organized way. It'll help make Morning Meeting everyone's favorite part of the day! These tricks are my favorite tricks for beasting it in the parent communication department. The thought of communicating with families is enough to give some teachers heart palpitations. I'm here to show you that it's actually a breeze with a few tweaks here and there! Let me help you reframe your mind here. There are a few things I do that make a world of difference for me each year. Click that picture above if you feel your palms getting sweaty just thinking about parent contact!! And, of course, if parent contact makes you feel faint, then Back To School Night is probably a huge ordeal for you. I like communicating with families, but Back To School Night really made me weak in the knees. I'd get butterflies in my stomach, and I'd feel like time was slowing down (and not in the good way!). Believe it or not, Back To School Night is one of my favorite parts of the school year now. Since making the switch to leading my Back To School Night like a Morning Meeting, my attitude towards this major school event has been super positive. Families like it this way too! If hosting a Morning Meeting styled Back To School Night isn't your cup of tea, there's still some great tips on here for you. And, finally, I've shared my tips for how to confer like a boss. Some of these tips I've gathered through working with Columbia Teacher's College staff developers, some I've gathered from who knows where. All I can tell you is that before I learned all of this stuff, my conferences were. A. HOT. MESS. Hot mess. But don't tell my principle that. If any administrators are reading this, I will have you know that I've always been an expert at conferring. (Guys, do you think I fooled them!?) Okay, seriously though. These tricks are amazing and they really help my teaching points to stick with the kids. When did school start for you? I start tomorrow (without kids), and then my first day back is Tuesday the 6th! EEEK! That means I'll be posting what my new classroom looks like pretty soon... I'm trying flexible seating for the first time, and I have to say, my room is COMPLETELY different. It's also a lot more open so far. What's going on in your room right now? Is Time Out Really Helpful? Best Year Ever Sale Starts NOW!